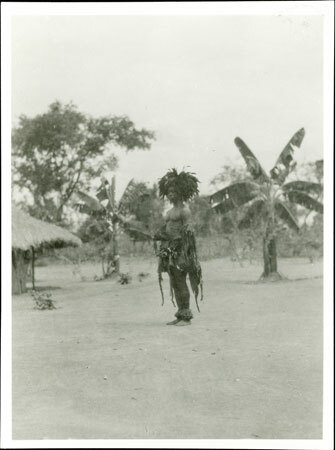 A binza (identified as Kamanga) standing in a homestead in full dancing apparel, including headdress. Kamanga was initiated in the abinza corporation at the instigation of Evans-Pritchard in order to gain ethnographic information about the corporation's medicines and ritual practices. Notes on card mount m/s pencil - "Fading 8.89"
Morton, Chris. "Zande binza (witchdoctor) " Southern Sudan Project (in development). 03 Jan. 2006. Pitt Rivers Museum. <http://southernsudan.prm.ox.ac.uk/details/1998.341.228.2/>.